Padraig Harrington admits he’s “stale” and desperately searching for a magic “key word” that could repair his shattered confidence. The former world No 3 is struggling massively to pull the trigger when he stands over the ball because he is lacking self-belief. He needs a key thought to take the club back and hit the ball but confessed at punishing Congressional that he just can’t find the “trigger word” that could halt his slide out of golf’s elite. Mentally tortured by his search for his golfing ‘Abracadabra’, he said: “Everybody has their way of pulling the trigger, my focussing the target is very stale at the moment. “I am trying hard to do it and because it is stale I am trying harder and that is not helping. Harrington and his mental guru Dr Bob Rotella have come to the conclusion that his slide to 52nd in the world has everything to do with trying too hard. As a result Ireland’s triple major winner is full of tension over the ball and that’s leading to erratic tee shots that could wreck his US Open chances. 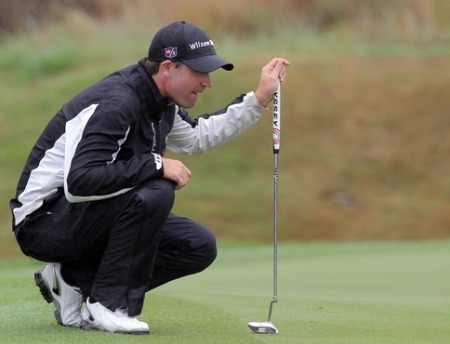 Admitting that his confidence has taken a knock as he tries to wait patiently for results, Harrington confessed: “I just have to let it happen. I’d be happier with my golf game now than ever. “But I’m just trying a little bit too hard and just putting myself under a little too much pressure and not letting it happen. “In the end of the day, it’s always difficult to match those two up. Which comes first, do you let the results happen and get the confidence from that or do you have the confidence first and the results follow? Focussing on his “target” no longer works for him and he is failing in his bid to find a new key word. In the past he would have two looks at the target and then hit his shots but he now finds that routine too “rigid” and is looking for way to free himself up. He said: “My key isn’t working at the moment so we have to figure out a way.